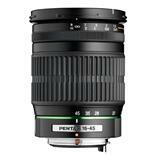 The SMC PENTAX-DA 16-45mm F4.0 ED/AL is recommended for use with digital cameras. It features a 3X zoom ratio with focal lengths covering ultra-wide angle to normal ranges, incorporates a high-refraction extra low dispersion (ED) glass element to produce a high-resolution, high-contrast image with true-to-life colour rendition, and aspherical lens elements to help transmit the light more efficiently through the lens to the film. The SMC PENTAX-DA J 16-45mm F4.0 ED/AL is well-suited for advanced amateurs and professionals.